In case you have not realized yet, I love creative shots. Most of my clients hire me because my pictures are "memorable." As such, I use every opportunity to create visually interesting photographs that my brides and grooms have never seen before. This particular wedding photo is a quirky environmental portrait of the bride and groom taken during their Country Heritage Park Wedding. Why Is This Such a Unique Picture? This image made it to my website's homepage, then it has to be special. What makes it so interesting? First, there are only a few old gas stations in the greater Toronto area. Photographing the bride and groom in front of the building erected at the beginning of the 20th century is a good start in creating a gorgeous environmental portrait of the bride and groom. Second, I have never seen this pose before. The bride and groom point the nozzle to their temple and make funny faces. The bride is dead serious while the groom is screaming, slightly bemused. Next, the photo stands out through its simplicity. 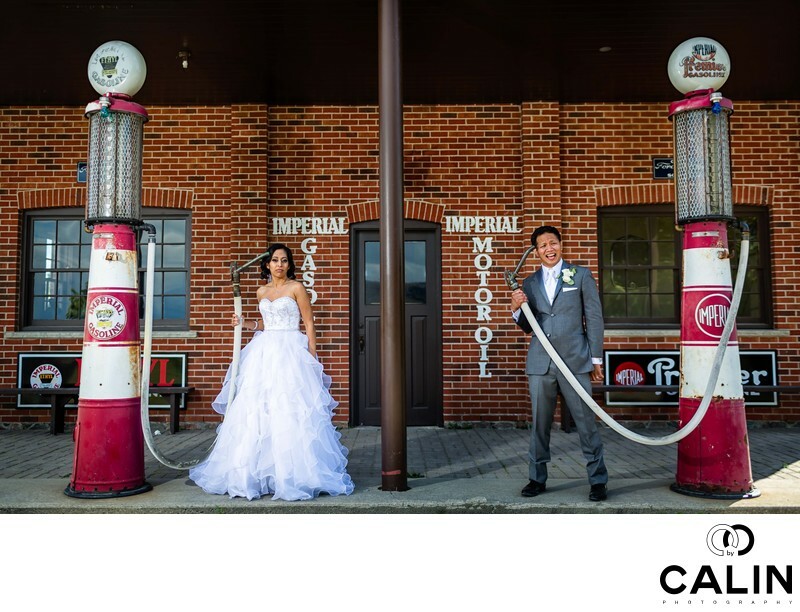 The old gas station with exposed brick wall complements the classical look of the bride and groom. From a composition standpoint, this is a symmetrical image. The bride and groom are framed according to the rule of thirds, and the two gas pumps have equal visual weight. All in all, this is a perfectly balanced image. In post processing I only added a vignette, removed some of the weeds on the concrete floor and eliminated a few rust stains from the gas pumps. Location: 8560 Tremaine Rd, Milton, ON L9T 1X9.